Brighton Flotation Bed Group with Fast Free Shipping! Elegant and stately storage bed with camel back shape upholstered headboard with button tufting. 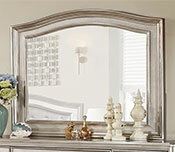 Individually mounted mirrors at footboard create a “Movie Star” glamorous effect. 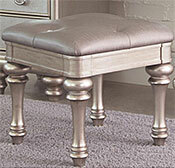 Glamorous platinum metallic finish with hand applied highlight glaze. The flotation system includes: Bed, Mattress. Foundation not required. Matching furniture available. 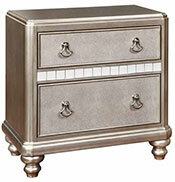 All matching furniture pieces have felt lined top drawers, silver ring pulls. The Brighton Flotation System includes: Storage Bed with Upholstered Headboard and mirrored footboard, 8" deep plush-top soft side mattress for a complete modern flotation system. Foundation not required. Available in Queen, King and Cal. King sizes. 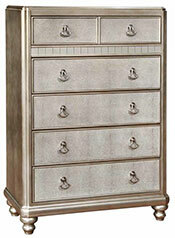 Elegant and stately storage bed with camel back shape headboard. 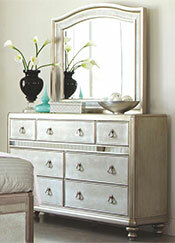 Glamorous platinum metallic finish with hand applied highlight glaze. Bed ONLY. Does not include mattress. Matching furniture available. Available in Queen, King and Cal. King sizes. 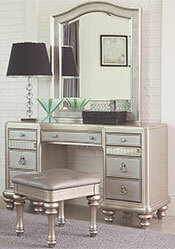 Glamorous platinum metallic finish with hand applied highlight glaze. Felt lined top drawers and Silver ring pulls. Jewelry Tray. Width: 51.5 x Depth: 17 x Height: 30. Order Stool Separately.